There is a long debate if green energy is efficient, but I do not want to get into such kind of discussions right now. It is true that green energy is not very well developed and still have flaws, but when companies will get better at production level, solar or wind energy will be effective. Anyway, fossil reserves will end someday, and unless there is another viable source of energy, I don’t see the point in providing good arguments for a technology that will deplete in the near future. Why to sustain something that is gonna end sooner or later ? In this post I want to write about the advantages and disadvantages of 3 green types of energy: solar energy, wind energy and hydro. From some points of view, none of them is perfect but the solution is to use them to complement each other. But if you only have to choose one, which will be ? Solar panels are pretty expensive right now, but the price is dropping very fast. For example, today you can buy a 200W module for less than 100 dollars. An average home consume about 10kw a day. which means about 500W/hour. With three 200W modules that you can buy with 300$ you can produce all the energy you need, theoretically, but here comes the downsides. Photovoltaic modules produce direct current, but in your house you need alternative current at 110V. You need something called an invertor, which will cost another $200. To build a photovoltaic system for your house you also need a lot of wires and some authorized guys to install it. This will cost at least $500 more. Considering all these costs, you can still save a lot of money. But in reality, there are 2 more things that you have to think of: storage and winter. What about storage ? 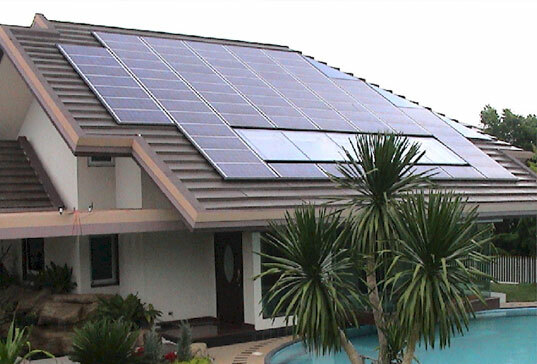 Photovoltaic panels will work close to maximum output when they have direct view to the sun. During the night, they will produce only a small portion of what they produce during the day, and usually only if there is some light reflected by the moon. Also, if there are clouds during the day, it might produce only 20%-30% of the maximum capacity. That’s only bad news, but there is a solution too. You might get a battery to store your energy. Considering all the above, you might need to store at least the energy for 3 days. For an average home, this will make it to 30kw. Batteries to store that energy will be about $3000. That’s more that what you pay for the whole system, but you need that too. What about winter ? During the winter the sun is present only half the time that it is present during the summer. This means that during the winter your photovoltaic panels will produce only about 40% ( on average ) of the maximum output. This means that you have to buy panels in order to produce about 3 times the energy you need, so you can be safe during the winter. For example, if you need 500W a hour ( on average ), the current produce by the solar panels in your system should be about 1500W/hour ( maximum output ). If you take into account that in time they will produce less power you will be safer if you buy panels that will have total maximum output around 2000W. Summing it up, you will need at least $10,000 to depend only on solar power in your house. What about industrial production ? The math is practically the same. If a large community is thinking to switch from fossil combustion to solar panels, they also have to buy 3 times more panels that they actually need, unless they are using the solar power during the summer and start their old coal plant during the winter. However, with such low costs to produce photovoltaic panels, buying more panels will not be a problem in the future. 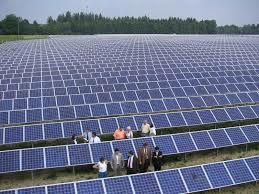 I think that solar energy is a good solution for the future. Also, you can take into account that different countries have their power grid interconnected so they can reduce the energy storage because when in some countries is night, in other countries it is day and they will exchange energy. More, in some countries might be summer while in others is winter, and there are countries where there is only summer. More, during the night, energy consumption is low because some factories are closed, people are sleeping, shops and malls are closed. The bigger the system is, the less storage it needs. Power produced from wind turbines is also very unstable. 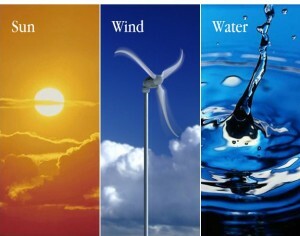 For example you can have weeks without a good wind, but then you can have weeks with fast winds. The technology behind wind turbines is old and has not been improved significantly lately, and probably there will be low improvements in the future. Usually, it takes a lot of turbines to produce small amounts of energy. 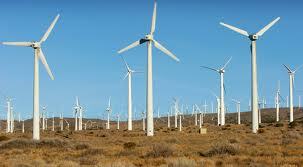 Wind energy also have to be stored, but in this case not for 1 night or 1 day, but for weeks. More, some researchers concluded that stopping the wind in a place will negatively affect the air flow in an area, and raising the temperature with few degrees. That’s bad news. And no one can be sure that if there will be too many wind power farms what will happen with the global wind flow. In my opinion, wind power is not reliable nor efficient. The technology to produce power from the water flow is also old. There will not be too many improvements in the future, but hydro power is already reliable and used as an efficient power source for decades. With some small variations, the water flow of a river is pretty much constant. 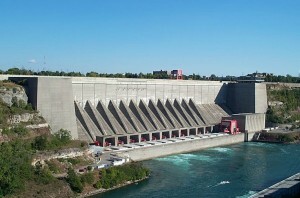 More, the hydro plants can be also used as an alternative energy storage. When the electricity demand is low, they can function only at a fraction of their full power or to be completely stopped. During this time, they can store the water in storage lakes so they can produce more energy when there is high demand. This fact makes hydro power very reliable, and there is no need for storage. It can be controlled very well and does not depend too much on the weather conditions. The biggest disadvantage of hydro power is that it is practically impossible to use at your home. Unless a river cross your land. Micro hydro plants have been developed that can produce power needed to sustain the demand for few houses only but they are too expensive and they do not have all the advantages of a real hydro plant. Water cannot be stored and there is very high costs for production and installation. 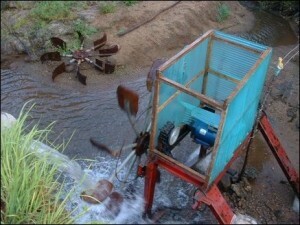 A small community with a river near can benefit of hydro power by building such micro hydro plant. The energy produced might be constant, and there is no storage needed.